We see a gallant knight proudly mounted on his steed. He has a cup in his outstretched hand as an offering. His helmet and footwear are adorned with wings, much like Apollo who was known as the messenger of the gods. When contemplating this card, the legend of Sir Galahad came to mind. The brave and pious knight of king Arthur’s round table at Camelot. He was the son of Sir Lancelot, and the chosen one whom Merlin had prophesied would surpass his father in valour and be successful in his search for the Holy Grail. This was a dangerous mission, many knights before him had died in pursuit of the Grail. He had been warned of the dangers, but chose to continue on his quest. He defeated rival knights with little effort, kept to himself, didn’t speak much to his companions, and was described as sinless and pious. It is believed that because of these virtues he was able to lead his companions to the Holy Grail with relentless determination. Of the three knights who undertook the quest for the Holy Grail, with Sir Bors and Sir Perceval, Galahad was the one who actually achieved it. When he did he was consumed by a bright light and died, taken up into heaven like the biblical patriarch Enoch or the prophet Elijah, leaving his companions behind in awe and wonder. It is the spirit of youth that drove this knight on his quest for the Holy Grail, while brave and virtuous he lacked the wisdom of the Queen or the experience of the King in tarot terms. It is therefore that he ignored the warnings of danger before ultimately being consumed by the light to join his maker in death. He was told of the risks, but went ahead regardless. Today’s message is all about taking the risks needed to accept opportunities and gifts presented to us. 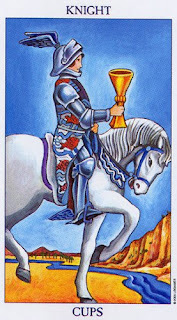 At times it becomes necessary to tap into the spirit of the Knight of Cups, and to accept the quest of the Holy Grail spurred on by the message of the gods as symbolized by the wings of Apollo. The Holy Grail may present itself to us as an opportunity to learn something that will make us better people. After all the Grail is exactly that, an object so holy that only the purest in spirit may stand in its presence. It is attainable only to those who have prepared themselves spiritually as the saintly Galahad did, and it is for this reason that we need the energy the drive and the determination of this knight in pursuit of our own Holy Grail. Our spiritual development prepares us to stand in the presence of this sacred discovery, namely that spark of divinity that is present within all of us. Today this card also nudges us to accept the gifts offered to us by the messenger of the gods. Gifts that will come in different forms for each of us, depending on where we are in our spiritual development. The point is to recognize it as a gift, and to accept it in order to further develop our beautiful spirits. A gift can come in the form of a message that has the potential to impact us in a way that will allow change. Yes, we may lack the wisdom or knowledge of how to fully utilise this gift when it is presented to us, but that too is part of the learning process. As we accept who we are, and allow our inner guidance to present us with messages, gifts and even opportunities designed to grow our spirit, so too shall we mature in wisdom and knowledge of application and effect. When we accept a spiritual gift or message, we may want to remember that these gifts are not meant to build character, they are meant to reveal it.